Our annual light shining, choir singing, contributor thanking, refreshment partaking, marshmallow roasting, light viewing, Santa wishing BIG AND FABULOUS WinterLights OPENING! It only happens once a year and it truly makes our holidays bright. Non-Members: Adults $15, Youth (ages 6-17) $10, Youth (5 and under) $7. Join The Elizabethan Gardens for the opening celebration of WinterLights, a spectacular twenty-two night event of holiday lights and sights. Find holiday warmth and charm inside and out with festive food and drink in the “Embellished” Hall, and cozy fire pits on the Great Lawn as well as seasonal gift shop and plant sales. Non-Members: Adults $15, Youth (ages 6-17) $10, Youth (5 and under) $7. Members/Friends: Adults $11, Youth (ages 6-17) $9, Youth (5 and under) $6. 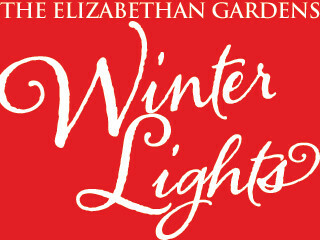 For info or details, call 252-473-3234 or visit www.elizabethangardens.org.